Monday was what I call a summer respite day. We look for heroes everywhere these days. Beth Goodell is a woman on the move. 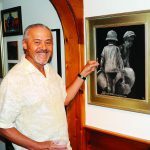 It was a lively scene at Carol Craven Gallery on State Road in West Tisbury at this past Sunday's opening of work by award-winning artist Harry Seymour. Dear Colorful Spandex Pants Bike Man, you're really getting on my nerves. Scott Blakeman is a standup comic known for blending political humor with contemporary Jewish material. The 22nd annual Sullivan 5K Run/Walk Road Race for Health and Fitness will be held August 28 in Oak Bluffs. Another summer has sped by. The private Vineyard Golf Club in Edgartown has gotten much favorable attention. They're called the Spanish Virgin Islands — Culebra and Vieques, two small municipalities off the east coast of Puerto Rico. What is that saying: the right place at the right time? Jennifer Clarke, Hollis Smith, Buddy Vanderhoop, and Peter Dixon found just that spot last week. I'm sitting here wrapped up in my favorite sweater, enjoying an early taste of fall. This is an open letter to President Barack Obama. Can it be that Labor Day is just a little over a week away? Summer was fantastic, but it is already time to get back to reality — especially for families. Entries by Island youth are always the best part of the Fair. Steamship Authority traffic volumes for Vineyard routes are comfortably up as of the end of July in all categories.